Scientists at Queen's University Belfast have led worldwide investigations into a mysterious object that passed close to Earth after arriving from deep interstellar space. Since the object was spotted in October, Professor Alan Fitzsimmons and Dr Michele Bannister from the School of Mathematics and Physics at Queen's University have led an international team of astronomers to piece together a profile of the strange visitor, which has been named `Oumuamua. Dr Michele Bannister and her team observed `Oumuamua while it was still within reach of the largest telescopes in the world and their findings are being published in Astrophysical Journal Letters later this month. They found the object was the same colour as some of the icy minor planets they had been studying in the outskirts of our solar system. This implies that different planetary systems in our galaxy contain minor planets like our own. Dr Michele Bannister said: "We've discovered that this is a planetesimal with a well-baked crust that looks a lot like the tiniest worlds in the outer regions of our solar system, has a greyish/red surface and is highly elongated, probably about the size and shape of the Gherkin skyscraper in London. She added: "We are continuing our research into `Oumuamua and are hopeful that we will make more discoveries in the near future. Discoveries like this really help to give a little more insight into what's out there and encourages people to look up and wonder." Spectroscopy reveals a thick organic layer coating the mysterious intruder from beyond the solar system. 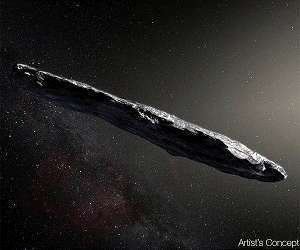 ʻOumuamua, the interstellar object that penetrated the solar system and was first noted in October 2017, is coated in a thick insulating layer of organic-rich material, according to a paper published in the journal Nature Astronomy. The paper, written by a team headed by astrophysicist Alan Fitzsimmons from Queens University Belfast in the UK, challenges the assumption – made by NASA scientists in November – that the object comprises rock and possibly metal, with no water or ice component. The research by Fitzsimmons and his colleagues suggests that ʻOumuamua may indeed be made of ice, but was insulated enough by the outer organic layer to pass relatively close to the sun without being vaporised. After ʻOumuamua – formally known as 1I/2017 U1 – was discovered, Fitzsimmons’ team used two facilities to conduct a spectroscopic analysis of the object. Readings were taken using the 4.2m William Herschel Telescope (WHT) on La Palma, and the European Southern Observatory 8.2m Very Large Telescope (VLT) in Chile. The results came up negative for tell-tale mineral traces, with the scientists finding no evidence that the object contained silicates, pyroxines or olivines. The data revealed that the composition of ʻOumuamua was quite similar to a class of asteroids known as D-types. Like these, and some other objects detected in the Oort and Kuiper belts, ʻOumuamua was observed to be red in colour. This hue, which varied across the 200-metre length of the object, is thought to be the result of cosmic irradiation of carbon-rich ices. The irradiation process, the researchers suggest, gave rise of the object’s thick insulating layer, which protected its internal ice-core from being damaged during its journey past the sun. Fitzsimmons and colleagues calculated that although the outer surface of ʻOumuamua likely reached about 600 degrees Kelvin during its passage past the sun, an insulating layer just 30 centimetres thick would have been enough to stop the ice below it melting. The team also calculated that the being made of ice would still provide enough internal strength to prevent the object fracturing as it rotates on its own axis. However, the scientists concede “one obvious problem” with their model. Many more Oort belt icy comets should have developed similar protective layers than current observations indicate. The astrophysicists suggest one possible explanation: ʻOumuamua may have experienced many close encounters with its host star – causing the comparatively rapid formation of an organic layer – before it was cast out and sent speeding towards our own.